A Journey of drinking tea and learning to crochet while living in Azerbaijan. 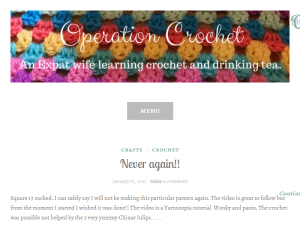 This what your Operation Crochet Blog Ad will look like to visitors! Of course you will want to use keywords and ad targeting to get the most out of your ad campaign! So purchase an ad space today before there all gone! Obama cheers on Fearless Parklands student. This is what a president should sound like. Respectful, articulate, encouraging, statesmanlike. Expressing faith in a generation and reminding them that not all adults put gun “rights” above their right to safely go to school. It’s time for change and that change will come from listening to the generation of future voters who do not want your archaic gun laws. It will not come from an old insane man in the whitehouse making ridiculous comments about arming teachers. Less guns not more is the answer…..
Day 31 I cant believe it, I actually finished! 31 days of running. 206km done. Its been a strange month. The new year started with me struggling mentally which carried on over the last four weeks for various reasons. I could quite happily have done what I have done in the past and completely hibernated from life. But I made a commitment so even when it sometimes felt like wading through treacle, I had to get on with it. I wish I had understood the power of turning up your music, putting on trainers and just moving when I was a suicidal, self harming, unmedicated mess, its possible I would carry less scars. Running for MIND has kept my head above water. Its helped me see that I am better off lacing up my trainers than opening a bottle of wine when I am not well. Even though I am quite looking forward to raising a glass to a job well done I think I will be trying to be more mindful with the bottle from now on. I prefer my runs without the hangover. Thank you so so much to everyone who sponsored me and supported me. You all went above and beyond once again. I have a couple of sponsors to add to my total but I will let you know what was raised soon. The encouragement really helped especially on those days where I would much rather have been in bed than running around Stonepay in the wind. The waves and messages were much appreciated. The sponsorship donations helped raised over £510K for MIND which means the Mind infoline can answer 850,00 calls next year! The biggest thank yous have to go to my lovely husband for buying me my treadmill so I had no excuses not to run and to my mini me and my friends, Liz, Claire & especially Zhanara who pushed me, who got up early or came out in the dark to run with me and kept me going another mile. If you are the owner of Operation Crochet, or someone who enjoys this blog why not upgrade it to a Featured Listing or Permanent Listing?